Here are several different ideas to help you process the grief you feel about the death of your dog. Nothing will take your loss away, but these resources will show you that you’re not alone. Grieving the Death of a Pet by Betty J. Carmack s a wonderful resource for helping you get through the grief of losing your dog. It’s a collection of people’s stories, vignettes, and voices reflecting the significance, depth and extent of grieving the death of a pet. Betty Carmack shares personal stories of her pet losses, and makes it relevant to people of diverse faiths and practices. Everyone grieves death differently – and there is a difference between grieving the death of your dog “versus” grieving the deal of a human loved one. Experiencing dog grief is different than human grief because our relationships with our dogs are unconditional and uncomplicated. Every one of us grieves the death of our dogs slightly differently, which is why this help for dog loss ranges from memorial lockets to donating to an animal shelter in your dog’s name. Here are a few different things that might help you process the grief you feel. Wear a locket with a sprinkle of your dog’s ashes. 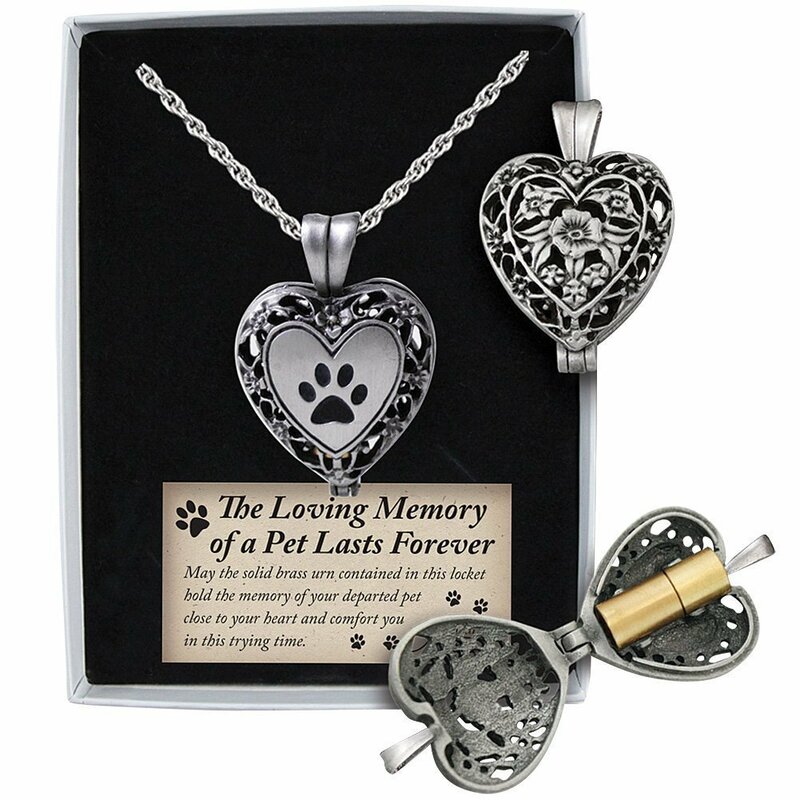 If you feel comforted by the idea of holding your dog close to your heart for the rest of your live, look into the Pet Memorial Heart-Shaped Silver Locket. It contains a small brass urn for a few of our dog’s ashes. Remember that grieving the death of your dog is a special process and a unique experience for every dog owner. Some dog owners find it helpful to grieve with a locket of their dog’s ashes, and others won’t. The most important thing is for you to find the right help grieving the death of your dog. If you feel comforted by the idea of a pet memorial but aren’t sure about a locket, read 7 Beautiful Pet Memorials and Gifts. Be aware of complicated grief. “Normal” grief is what healthy people feel when their grieving the death of their dogs. There may not be exact stages of grief, but there are a few emotions we all feel, such as sadness, denial, anger, bargaining, depression, and acceptance. Complicated grief is more intense and long-lasting. Some psychiatrists and psychologists even call it a disorder, because it takes over your life. You more or less cease to function – you take no joy or happiness in any of the things you used to. Think about getting a Cuddle Clone. A Cuddle Clone is a soft and adorable, one-of-a-kind plush version of your pet. They are handmade with the most premium plush materials – they are extremely soft and cuddly. You have to feel them to believe it! They use water-based airbrushing techniques to get certain color effects. I learned about Cuddle Clones from a reader who had one made, in memorial of her dog. Again, this type of help grieving the death of your dog may work for you…or it may not. It depends on your personality and way of processing loss. Take a trip to spread your dog’s ashes. One of my readers is taking a trip to her cabin, and spreading her dog’s ashes there. They spent summers there – all 15 years of her dog’s life. For her, it helps to grieve her dog’s death by going to their special place and saying good-bye. She’s planning a memorial service. A ritual like this can help you process your loss, and can help the grieving process after your dog’s death. Forgive yourself. On Dealing With Guilt When You Caused Your Pet’s Death, a reader describes how his emotional attachment to his pet blinded him. He made decisions about his pet out of what he calls his selfishness, and may have damaged his beloved pet’s health. If you’re in a similar situation – if you feel guilty about your pet’s life or death – I encourage you to talk to someone about it. Sometimes guilt turns into shame, which affects how we see ourselves. If you think you’re a horrible terrible no-good person – if you hate yourself for what you’ve done – please talk to a professional in person. Donate to an animal shelter, in memory of your dog. If you can afford to make a financial contribution to a humane society, you might ensure that your dog’s soul will become entangled with the spirits of the dogs you are helping! Of course I don’t know if this is true, but it has helped me grieve the loss of my dog if I believe that my contribution here might have an effect on my dog’s spirit. My prayer for you as you grieve the death of your dog is that you are able to turn to the Source of all comfort and peace. May you reach out to God for healing and strength, and for the energy to keep moving forward and actually enjoying your life again! May you forgive yourself for the mistakes you made, and may you accept the forgiveness and love that only God can give you. May you be filled with the spirit of joy, peace, and energy. Amen. If you feel like you can’t live without your dog, you’re not alone. One of my most popular articles is about surviving the pet death – it was so popular, I interviewed veterinarians, grief experts, counselors, and pet owners and wrote Letting Go of an Animal You Love: 75 Ways to Survive Pet Loss. I welcome your thoughts on my help grieving the death of your dog. You’re welcome to share your dog stories and memories, and even say a prayer of blessing on your dog’s spirit.